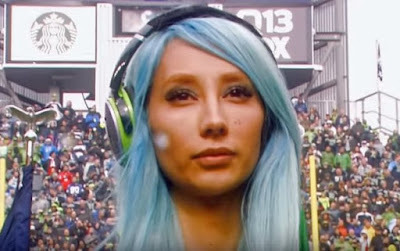 Guns N’ Roses keyboardist Melissa Reese performed the national anthem prior to the Seattle Seahawks game against the Atlanta Falcons at CenturyLink Field in Seattle, WA on October 16 and video from the event is available. The Seattle native joined GNR this year as the group’s second keyboardist alongside Dizzy Reed for the partially-reunited band’s Not In This Lifetime tour. Following Reese’s performance, GNR founding member and bassist Duff McKagan was also on hand to raise the 12 Flag before the game in the team’s traditional salute to fans. Guns N’ Roses North American summer stadium tour grossed $116.8 million while selling more than 1 million tickets from 25 concerts in 21 stadiums over the 9-week run. Featuring the reunited trio of McKagan, Axl Rose and Slash, the tour resumes with shows in South America beginning in Lima, Peru on October 27 with dates running to the end of November.